A good friend gave this to me for my birthday, and I promised him I would watch it before the end of the year. This was a great film! It's clever and imaginative, artistic, smart, and very funny. The gags and their timing are perfect, the stunts make you sit back in amazement, knowing that Keaton did his own stunts, and Keaton's sad little everyman is one of the best characters of the silent era. Yes, the technical aspects are dazzling, with all of the inventive special effects and camera tricks that Keaton employs here, but most of all it's a really good film. Did I mention funny? I'm sure I did - and I will again. It's a really, really funny film. I'm not sure how it could be made better. 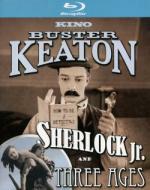 Highly recommended for any fan of silent comedy - or anyone who wants to try a silent comedy. May have to check this one out.